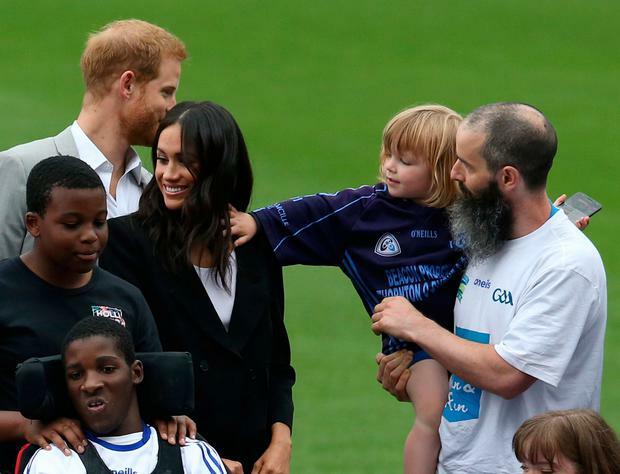 Children stole the show on Prince Harry and Meghan today, with one young boy pulling Harry's beard and another reaching out to touch Meghan's hair. 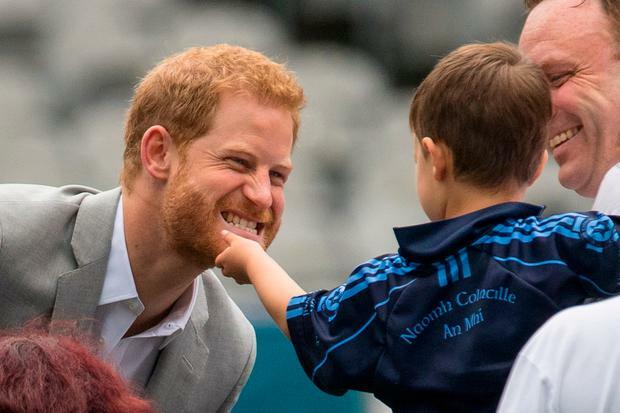 As the royal couple toured Croke Park, where they were saw GAA football and hurling displays, Harry leaned in to say hello to Dylan Mahon, who grabbed the smiling prince's beard, as Meghan covered her mouth laughing. 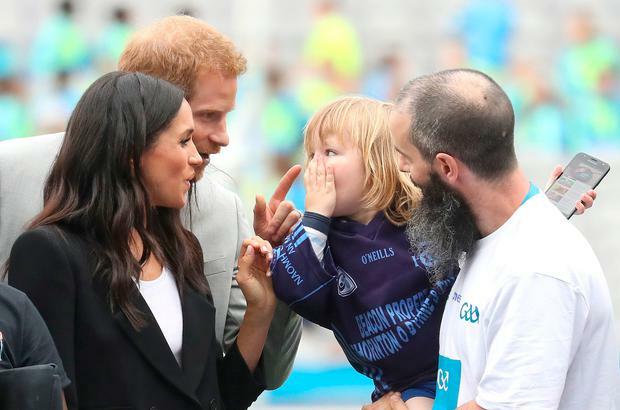 Harry grimaced in mock pain and told the four-year-old, from Grange Rath, in Co Meath: "You might have a beard soon, you never know." Little Walter Kieran, three, touched Meghan's hair as her head was turned away, causing her to spin round in surprise. The youngster then appeared to touch her face, and as Harry wagged his finger at him in comic disapproval, Walter covered his mouth. No-one seemed to mind the breaking of royal protocol on the second part of their two-day visit to Ireland. The couple spoke to young children about their involvement in sport and what it meant to them playing in Croke Park. Nine-year-old Caoimhe McMenanmin, from Co Donegal, spent some minutes taking the couple through the rules of Gaelic football. "It was exciting to meet them, but I was nervous," she said. Cara Leonard, 12, from Co Tyrone, said: "They are just like normal people, I was surprised. "I told them it meant everything to play in Croke Park." Eight-year-old Tom Whooley, from Clonakilty in Co Cork, said it was really exciting to meet Harry and Meghan. "They shook my hand and Harry asked can I please have a feel of your hurly and then he said it's quite light," he said. "He asked me what does it mean to play in this grass and I said everything. "He asked why I liked this grass so much and I told him it gave me a good feeling." Harry also met a red-headed Nathan Kiely, seven, and told him how impressed he was with his freckles. Jennifer Lawless, 22, an intern from North Carolina, revealed: "He said, 'You have more freckles than I have. Lovely freckles!'" Harry and Meghan were taken on a tour of the stadium's museum before going on to the pitch for a sports demonstration. The newlyweds were welcomed to the home of the GAA by GAA president John Horan, GAA director general Tom Ryan and Croke Park stadium director Peter McKenna. Some of the county's most famous GAA stars showed off their skills, including Donegal footballer Michael Murphy and Galway hurler Joe Canning. Dozens of children played Gaelic football and hurling as the couple watched on. They walked hand-in-hand around the famous Dublin pitch as GAA representatives talked the couple through the rules of Gaelic games. 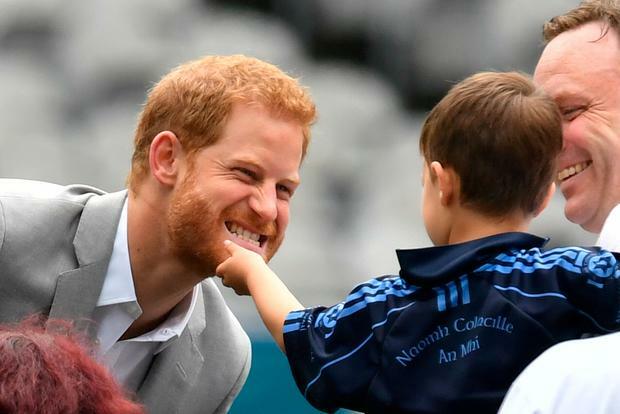 It was hoped that Harry would have a go at striking a sliotar, but he turned down a request by Canning. Canning said: "I did ask him, I don't think he wanted to. "I was thinking he might but he'll stick to the soccer later on." Harry, who jokingly described Canning as God, also spoke about England in the World Cup semi-final on Wednesday. Canning added: "They're lovely people. They are very down to earth."